This year we are moving into the main Warwick Racecourse grounds providing us with increased facilities and more space. As well as the main fireworks show, we will also be providing an additional fireworks display for small children. We also get to use the Racecourse tannoy system to help make sure that everyone gets to enjoy the music that goes along with the show. The gates are opened at 17:00 with refreshments, two child entertainment areas and live music. At 18:00 there will be an 8 minute firework display for the younger children and early arrivals, then around 18:30 the mayor and VIP's call for the the bonfire to be lit in it's new location. The main firework display (19 minutes and set to music) should then start about 10 minutes after the bonfire is lit, (usually around 18:45). What's happening with the fire this year? Due to the changes taking place with the St Mary's Lands at our previous event location, we can no longer have the fire on site. 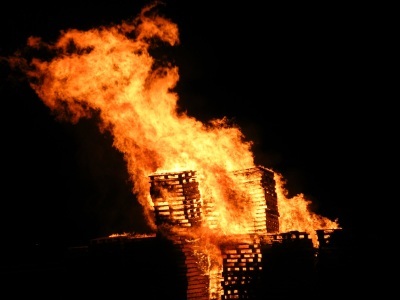 We will however still have a bonfire, it will just be a bit further away! What time does the display finish? The main firework display lasts for 19 minutes and should finish around 19:00. The refreshments and entertainment stay open until 20:00. Disabled parking is available at the southern end of the site. Most of the site is tarmac providing a stable level surface. The display is visible from the main disabled parking spaces should you wish to watch from your car seat. We are lucky compared to most firework display sites in bad weather because of our great location. All of the site is covered with tarmac or hard standing so there are no muddy fields to walk through, (some puddles do gather in the rain). This year we also have the Racecourse Grandstand which will provide some cover from any rain. If the wind is particularly bad then we may be unable to light the bonfire safely, however the firework show should go ahead in all but the stongest of winds! We do not sell sparklers on-site, but you are welcome to bring your own. We ask you to use the water buckets provided and to keep to the less crowded areas when lighting them. We do not allow people to bring dogs on-site. Although some dogs are ok with fireworks, we do not think the loud noise and crowds is the best environment for them. There are various stands around the site selling food and drink, also this year the racecourse bar in the main grandstand will be open. Tickets can be bought online using card payments up to a day before the show. We accept Visa and Mastercard on some gates, however paying by cash will be faster. Is there any way to pay for tickets by phone? We can't take payments by phone. Advance tickets can be bought online using the Warwick Racecourse site or at local shops. Our website button will only be visible when tickets can be bought online. This is from early October through to the Friday before the show, (tickets bought online can be printed out and handed in at the gate). 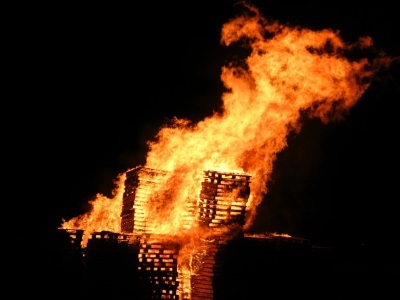 We use pallets sourced from local suppliers to build the bonfire. We don't accept wood from any other sources. What happens to the money raised from the event? All money raised from the event goes towards local charities and good causes, distributed by Warwick Lions and Warwick Rotary charity clubs. Do children need advance tickets? We've raised the age required before paying full entry to 15+ this year (from 12+) with children 3 and under getting in free. Advance tickets are available for ages 4-14 and 15+, or they can be bought on the gate. Why have a second fireworks display? This year we wanted to provide a second smaller fireworks display as a bonus for those arriving early. This has the added bonus of providing a taster display that should hopefully be more appreciated by the smaller children who get cold and scared of the loud bangs in the main show. Why not have a longer main display? The smaller display before is a completely new addition. Rather than being reduced, the main firework display has also been expanded to make it even bigger and better than ever before! !